1. Skin and finely chop 100g haddock or coley fillet. Alternatively, place it in the food processor and pulse to a chunky paste. 2. Mix the fish with 1 tbsp chopped parsley, 1 tsp rinsed capers, and the zest of ½ lemon. Squeeze the mixture together well, then, with a dusting of flour on your hands, shape the mixture into a burger. 3. Heat 1 tbsp olive oil in a non-stick frying pan over a medium heat and cook the burger for 4–5 minutes on each side until golden and firm to the touch. 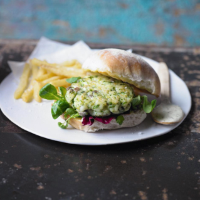 Serve the burger in a bun with salad leaves, a spoonful of essential Waitrose Tartare Sauce and a few oven fries, if you wish.